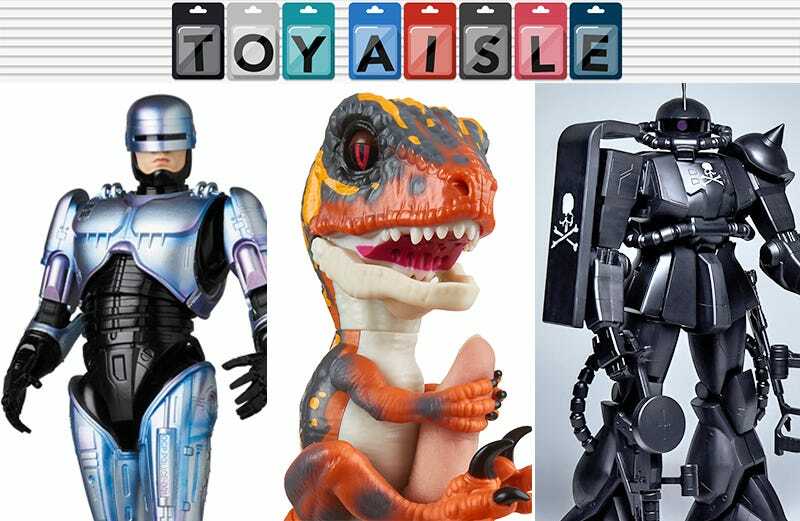 Welcome back to Toy Aisle, io9's regular round-up of the coolest (and often the shiniest) toys and merchandise we’ve been ogling lately. This week: some remarkably stylish Gundams, some weirdly cute finger-mounted dinosaurs, and more Avengers figures than you can shake an Infinity Gauntlet at. Check it out! You don’t have to follow fashion to appreciate Mastermind Japan’s (a Japanese fashion label) customized Gundam models. The 1/12th-scale and 1/60th-scale MS-06S ZAKU II and the 1/60th-scale Unicorn Gundam 03 Phenex both feature murdered-out, all-black paint schemes, with the fashion brand’s skull and crossbones logo adorning their shields and armor—in this case, the logo really works. The 1/12th-scale ZAKU II, which stands almost five feet tall, will set die-hard Gundam collectors back well over $6,600. But at $200+ for the 1/60th-scale version of the ZAKU II, and $1,000+ for the smaller Unicorn Gundam 03 Phenex, collectors are still going to have to cough up a lot because of the fashion label attached to both of these. RoboCop, the original iron man, suffered the same fate as Tony Stark’s alter-ego with a fantastic movie followed by a handful of terrible sequels. But while RoboCop 2 was a massive disappointment, it didn’t make the idea of a half-robot-half-human-cop any less cool, and it gave RoboCop some shiny iridescent armor that Medicom has recreated with its new 6.3-inch, fully-articulated figure. It comes with swappable helmets, hands, faces, and even an opening leg holster for Robo’s Auto-9 pistol. You can drool now, but you’ll have to wait until early 2019 to drop around $75 on this one. If you tried (and probably failed) to get your hands on one of WowWee’s Fingerlings toys this past holiday season, you’ll understand why the company is ensuring there are plenty on store shelves now. And because there’s another big-budget dinosaur movie en route, we’re now getting dino-themed Fingerlings, starting with these four baby raptors featuring touch-activated sounds and snapping jaws. They’ll hit stores in May for $15 each, and will thankfully never grow any larger than this.